In its first iteration, Imagination Stage “had a board of two husbands and a cat,” remembered Founder and Executive Director Bonnie Fogel. The need for Imagination Stage had equally humble roots, growing out a desire to sustain and enhance the meager art offerings at a local elementary school. 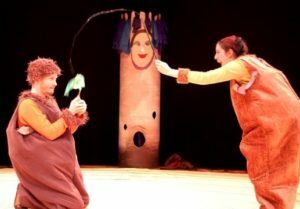 Founded as the Bethesda Academy of Performing Arts in 1979, Imagination Stage “was a sort of mothers’ project to give to our children and the children in the neighborhood,” explained Fogel. That beginning ensured long hours and no salary for the first five years, with all proceeds going back into projects. “We kept making accommodations,” noted Fogel. “We worked harder, worked longer. After a couple of years, we decided we really did need a board and a plan, and that’s when we put it together.” At the time, Fogel wrote periodically for the Montgomery Journal and worked at home for a databank, but Imagination Stage soon became her sole employment. A native of England, Fogel brought a retail background to Imagination Stage and remains focused on the business aspects of running a non-profit theatre. 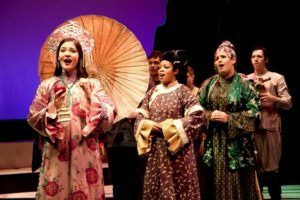 The teaching and artistic direction responsibilities were delegated to her early partner in the project, a role later shifted to a full-time artistic director. Imagination Stage’s current facility, constructed in 2001, features two theatres, the Annette M. and Theodore N. Lerner Family Theatre, which seats 364, and the smaller Christopher and Dana Reeve Studio Theatre, with seating for 142. 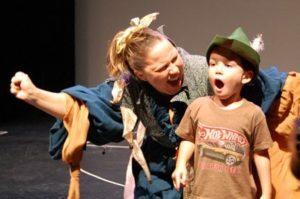 The Lerner Family Theatre produces works for children ages 5–12, while performances in the Reeve Studio Theatre offer engaging works for younger children ages 1–4. For the latter performances, children sit in a circle around the actors for a blended class–performance experience. Annual attendance of all shows exceeds 110,000 children and families. Most shows are performed by professional adult actors, with classes and camps providing opportunities for children to transition from audience to cast. The commitment to producing TYA extends to the commissioning of new works. Imagination Stage has commissioned more than 40 original works over the years, often from playwrights living in other parts of the world, where TYA historically has been more common. “We do that because there’s very little available, with too much of what I call ‘fuzzy bunny’ theatre,” said Fogel, who lamented the patronizing tone of many works that target young audiences. Works commissioned by Imagination Stage, in contrast, seek out original, well-written plays in which adults enjoy the production as much as the children, whether through references to previous eras or puns. Imagination Stage provides a booklet with information on what to expect to help prepare children for the stimulating environment. Imagination Stage has an ongoing relationship with The Washington Ballet, and a recent collaboration has produced The Little Mermaid, which is set to run at the Lerner Family Theatre from June 22 to August 14. Written by Imagination Stage Artistic Director Janet Stanford, the work integrates dance and theatre, with dancers representing the soul of a character while actors portray voice and action. As a grandparent myself and someone who has observed the world for a long time, we are people who represent an older generation and culture and way of being in the world. We owe it to our children and our grandchildren to get them to the theatre—to give them some “slow food,” to sit and quietly enjoy something that is good for them. I notice with my own children, in their 40s, they have no time to take the children to the theatre because they’re so constrained by things they “have to do.” There’s no prioritization for going to the theatre as a family and watching something that is going to be so good, something they can enjoy talking about beforehand and afterward. That is the gift that we need to give as thoughtful adults who care about what our children and grandchildren are doing with their lives. Those of us with a little bit more time who are not caught up with everything, we need to think about what’s important. Enjoying theatre together is one of those really critical things. In addition to regular shows, Imagination Stage offers space for special events and performances. Learn more by contacting Imagination Stage at rentals@imaginationstage.org.